Three long days have passed since cards first hit the air for the WSOPC Caesars Atlantic City Main Event and it has finally ended with Ryan Eriquezzo taking down the title. 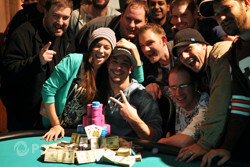 He battled his way through 640 other entrants to claim the National Championship seat, the WSOPC gold ring and $191,194. 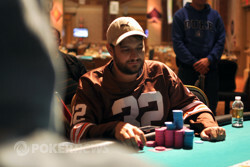 Eriquezzo used one bullet on Day 1a and finished the day with just 32,000. When play ended on Day 2 he was 16th of 22 players with just 421,000. 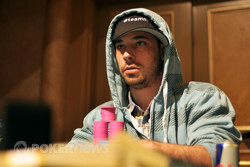 By the time the field was trimmed to two tables on Day 3 he was fourth in chips with 1.15 million. This is Eriquezzo’s second WSOPC gold ring, he won a preliminary event at the New Orleans circuit stop in 2010. Since then he’s done well – winning a Six-max event at the Borgata Winter Open and finishing in 131st place in the 2011 WSOP Main Event. Eriquezzo stayed out of the way during the early goings of the final table and let the other players beat each other up. At six-handed play he turned up the and started gaining momentum. He won a tournament-changing pot when it was five handed. Eugene Fouksman open-shoved from the cutoff and Garry Gates also moved all in from the button. Some jaws dropped when Eriquezzo surprised everybody and called. The board ran and Eriquezzo took charge of the tournament. Eriquezz entered heads up play with David Zeiltin with a 2-1 chiplead. The pair battled for two levels and Zeitlin would be ground down and then work his way back up. Zeitlin never pulled even but his luck couldn’t last forever. Zeitlin four-bet shoved preflop and Eriquezzo called holding and was up against pocket deuces. The crowd built as the dealer peeled off the flop . The turn came , which took away two of his outs. “Should I do it to you?” Eriquezzo asked. The dealer burned and turned the on the river and shipped the tournament to Eriquezzo. David Zeitlin opened to 210,000 with the button, Ryan Eriquezzo three-bet to 520,000 and Zeitlin moved all in. Eriquezzo quickly called. The rail was three deep surrounding the table as the dealer burned a card and fanned . "Whats a sweat?" someone shouted. The turn was neither a nine or a queen, it was the , which took away two of Eriquezzo's outs. "Should I do it to you?" Eriquezzo asked Zeitlin, who shrugged. "Nice hand." It may not have been the reverse jinx that did it, but the slammed on the river, giving Eriquezzo the winning hand and the championship. Zeitlin will not leave empty handed. For his efforts, he will bank $118,307. Ryan Eriquezzo is inching closer to victory. Ryan Eriquezzo opened to 200,000 with the button, David Zeitlin called, and the dealer fanned . Zeitlin checked, and Eriquezzo continued for 225,000. Zeitlin check-raised to 575,000, and Eriquezzo tank-called. Both players knuckled after the turned, and the suicide king - the - completed the board. Eriquezzo slid out 400,000 in blue T25,000 chips, sending Zeitlin deep into the tank. He eventually made a crying call. "It's good," Zeitlin sighed, mucking his hand. The players are now on a fifteen-minute break. After losing a few pots, David Zeitlin opened to 170,000 with the button. Ryan Eriquezzo called. The dealer fanned , and Eriquezzo checked to Zeitlin who continued for 120,000. Eriquezzo check-raised to 270,000, and Zeitlin check-called. Both players knuckled after the turned, and Eriquezzo checked again after the completed the board. Zeitlin slid out what appeared to be 350,000, and Eriquezzo quickly released. The two players are now back where the started. Again. David Zeitlin has strung together a handful of smallish pots recently and has pulled back to where they started heads up play.